Casablanca (1943): Dir. Michael Curtiz. Written by: Howard Koch, Philip G. Epstein, and Julius J. Epstein, with contributions by Casey Robinson. Based upon the play Everybody Comes to Rick’s by Murray Burnett and Joan Alison. Starring: Humphrey Bogart, Ingrid Bergman, Paul Henreid, Claude Rains, and Conrad Veidt. Rated PG for mild violence. Running time: 102 minutes. 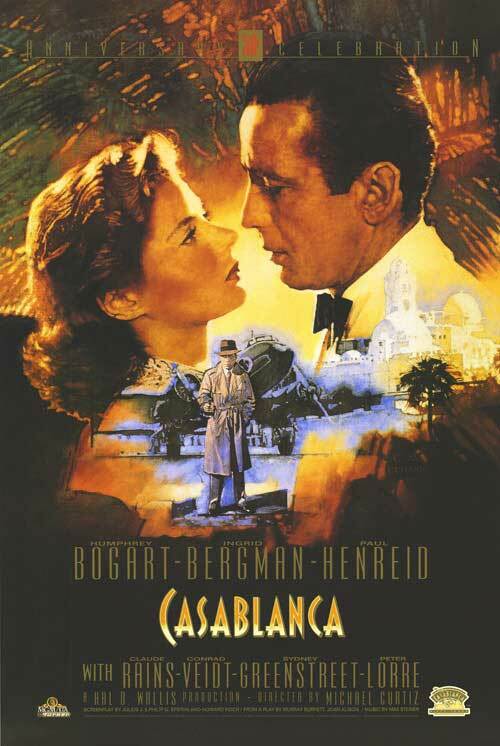 Unlike the previous film, Casablanca is compulsively watchable, full of witty dialogue and memorable characters. Perfect? No. Well worth your time? Yes. We’re in the midst of World War II, and French Morocco has become a waiting area for people trying to escape the Nazis to America. Rick Blaine, proprietor of Rick’s Café Américain, has come into possession of two Macguffins, er, letters of transit, ensuring safe passage to America with no questions asked. When an old flame comes back into his life, he’s faced with an ethical decision—book it to America with the dame, or furnish her revolutionary husband with a one-way ticket past the Nazis? Like Mrs. Miniver, Casablanca represents more hoopla for the war effort, but it’s much more fun thanks to a whip-smart script and brisk, dynamic direction. Director Curtiz skillfully immerses us in the Café to the extent that it becomes a character in itself—sketchy and decadent on the outside, but perhaps hiding a heart, if only we took the time to look. The repartee in the film achieves a kind of sublimity, in which one-liners and double-entendres are exchanged with wit and glee. Humphrey Bogart, Ingrid Bergman, Claude Rains and others seem to trot out the words effortlessly, as well as suggest the internal torment of their past lives. And the film takes its time with Rick’s eventual revelation about himself and the world at large. True, the classic is not without its flaws. Bergman’s character, for one, exists only in relation to the men in her life, and her husband Victor Laszlo comes across as stiff and dull, something greatly at odds with his supposed revolutionary ways. The plot twists and turns, but these machinations enable a desired political ending rather than reveal true character complexity. That said, no frame of this film feels dull or stagnant. You’d be hard-pressed to find more palatable propaganda.